Kristallnacht - The end of the beginning or the beginning of the end? Centropa, a Vienna-based oral history project, interviewed 1,200 elderly Jews in Europe, almost 100 of them in Vienna. Rather than use video, we digitized the interviewee´s family snapshots. 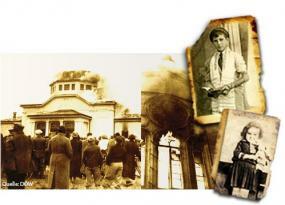 For this website, which commemorates the Novemberpogrom against Jewish citizens in Germany and Austria in 1938, Centropa has selected 15 excerpts from our interviews with elderly Viennese Jews that we conducted since 2000. German and Austrian Jews brought Nobel prizes and Olympic gold medals to their countries. They had fought in their armies, built businesses and raised families. But with the rise of the Nazis, it had all been for naught. The November pogrom against Jewish citizens throughout Germany and Austria in 1938, infamously known as "Kristallnacht", was a turning point in history. 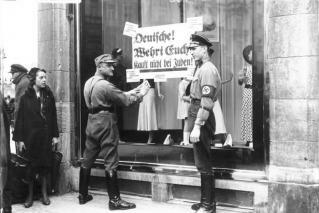 The pogroms marked a dramatic intensification of Nazi anti-Jewish policy. Read how our Austrian interviewees remember the Anschluss of March 12, 1938, the following months, the night of November 9, 1938, and what happened to their families in the days and weeks after. We thank the Austrian Future Fund for sponsoring this commemorative website.